Norway is today commemorating one year since 77 people were killed and 242 hurt in gun and bomb attacks in Oslo and on the island of Utoeya. Church services, a concert and other events are being held around Norway. PM Jens Stoltenberg will lay wreaths and is expected to be joined by hundreds of people on Utoeya, including the families of those who were killed. Anders Behring Breivik, who has admitted carrying out the two attacks, remains on trial. Thousands of people are expected to gather in Oslo for a day of events, including a memorial service at the city’s cathedral. Jens Stoltenberg will lay a wreath at the site of the Oslo bombing at 09:30 and then travel to Utoeya to give a speech to Labour Party youth, before laying a wreath there at 18:45 – the time Anders Breivik was arrested a year ago. 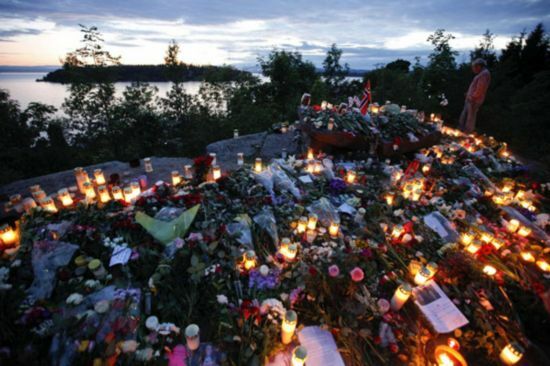 In the evening there will be a national memorial concert with mainly Norwegian musicians. Many of the buildings that were damaged in the bomb attack have not yet been fully repaired. The prime minister’s office and the ministry of health buildings are still covered in plastic. The attacks, regarded as the worst act of violence in Norway since World War II, sparked a national debate about the nature of tolerance and democracy in the country. Anders Breivik, who has been on trial for three months, has tried to justify the attacks by claiming he was trying to stop Muslims from taking over Norway. But the government, and much of the population, have actively promoted tolerance and openness to counter Anders Breivik’s views. “I think that people thought it a bit naive to cling to these values of openness in a situation like that,” said Vegard Groeslie Wennesland, a Labour Party activist who survived the attack. Judges are to announce next month whether Anders Breivik is sane or insane, and therefore whether he will be given a long prison sentence or be sent to a secure psychiatric ward.